Bring to boil for 2 minutes the carrot, cauliflower and the celery then rinse in cold running water. 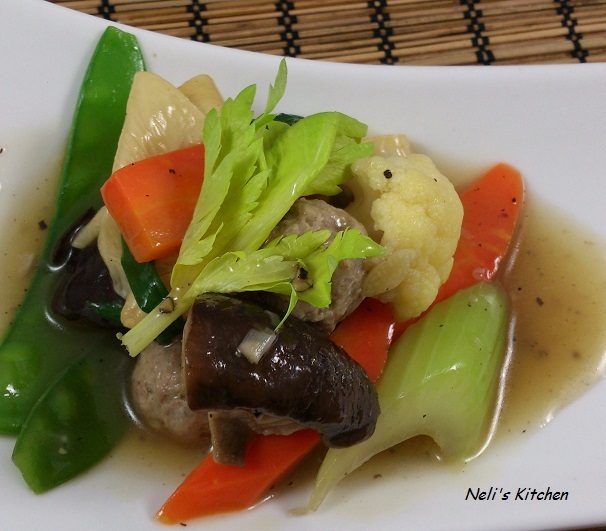 Heat a tbsp of oil over medium heat and fry the garlic until fragrant, then add the snow peas, mushroom, tofu skin, beef balls, cooked vegetables and chicken broth. Add ground black pepper, soy sauce and pinch of salt. In a bowl, mix 2 tbsp water and a tbsp cornstarch and pour in the vegetable. Cook until the juice thickens. Add the green onion and transfer onto a serving plate.